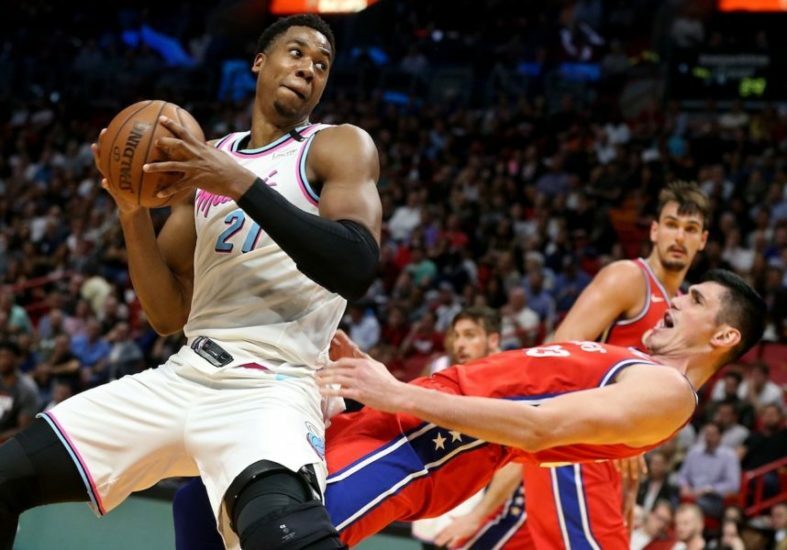 Miami, FL – It was another wild night in Miami as the Philadelphia “Trust the Process” 76ers came to town play their 4th and final matchup against the Miami Heat. These Sixers can’t get enough of Miami, huh? Didn’t Wade just hit a game winner against them like a week ago? All four of these games have been so intriguing as every single one has been a dogfight. This one was a bit different from the previous three, as the Heat relied on their defense and collective effort to take control of the game in the 4th quarter and take the final matchup of the season series, both teams protecting home court. The stakes were high in this one with the 76ers currently standing in the 6th seed and the Heat at 7th. The stakes were even higher for Miami, with this game being the last one that featured the Miami Vice Jerseys. They finished with an 8-7 record in the Vice Jerseys, so now we can definitely make the case to bring them back next year if they haven’t already decided to do so. Hell, bring them back but in black! Whiteside must’ve had some fire Wheaties this morning. In fact, since Embiid’s coming to town, Whiteside must’ve said “I’ll have two cereal bowls today.” He was absolutely engaged from the start. Shooting jumpers, fadeaways, creating in the post, he was getting what he wanted. His defense on ‘Twitter Fingers’ Embiid was phenomenal as well. There was this one play where Whiteside blocks an Embiid layup, they get tangled up and Whiteside ends up hitting himself, which, I mean, of course he ends up hitting himself. Whiteside finished the game with 26 points, 8 rebounds, 2 blocks, and 2 balls on Joel Embiid’s face. The man deserves the game ball. As mentioned before, the Heat received contributions from so many guys. Dwyane Wade continues to score, adding 16 points on 7-13 shooting. By the way, the guy still has bounce in his game. Huge shoutout to his personal trainers and that Heat Culture juice. Wayne Ellington came back after missing four straight games with a quad injury and dropped three 3-pointers in the 4th quarter. Kelly Olynyk, Josh Richardson, and Tyler Johnson all made an impact on the game as well. Also, Wade coming back has really brought the best out of Winslow. He’s continuing to have an impactful month of March, and keeps making big plays on both sides of the court. He made two big three’s tonight in the 4th and had some huge plays on the defensive end. Miami’s 108-99 victory puts them only a game back behind the 76ers. The Heat next play the Washington Wizards this Saturday at the AmericanAirlines Arena.